Part of Wisport’s line of the latest generation of survival backpacks, the Whistler 35 II Rucksack was developed in collaboration with Polish Military Forces and offers a great amount of carrying space in one unified and comfortable to carry body. Wide and ergonomically shaped shoulder straps, together with a padded waist belt help to distribute weight evenly and relieve pressure from your back. The belt can easily be detached from the rucksack enabling different carrying configurations. The expandable main compartment of the Whistler 35 II comes with two-way clamshell zip opening, two internal zipped pockets, hydration sleeve, MOLLE panel, and four D-Ring attachments points. The outer side of the main compartment features an admin compartment with two-way zip opening, multiple sleeve and mesh pockets, and three internal elastic loops. Moreover, a front zipped pocket with zipper track cover, and two spacious side sleeve pockets offer additional storage space for maps, water bottles or GPS units. Multiple MOLLE attachment points featured throughout the pack allow for mounting of various accessories, i.e. backpack bags, first aid kits and pouches. Thanks to this the overall capacity of the rucksack may be significantly greater than 35 liters. The Whistler 35 II backpack comes with a rain cover as a standard accessory, hidden in the compartment on the bottom of the bag. Disclosure: Military 1st contacted me to try one of their products. They recommended the Wisport Whistler 35 II Rucksack. It was provided at no cost to me. My only responsibility was an agreement to complete this review after trying the item. I was not pressured in any way to make a positive endorsement. The storage capacity of the Wisport Whistler 35 II Rucksack is 35 liters, pretty roomy for a day pack, but smallish for a thru hiker’s needs. Consider it optimal for long day hikes or short overnights. As mentioned in the description above: pockets, pockets, pockets. It also has a removable internal aluminium frame if you wish to lessen the weight a bit. Ergonomically adjustable shoulder straps with hydration brackets, elastic loops, and quick release chest strap are designed for convenience, as is the wide and removable hip belt with oversized quick release buckle. Both help this pack ride comfortably through your torso. Multiple MOLLE compatible attachments points are located throughout the pack. Side, top and bottom quick release compression straps make it easy to carry a sleeping bag, pad and tent. Allows for use of CAMELBAK and Crystal Creek hydration systems with plenty of room to spare even with a 3 liter bladder. Uses durable non-rusting zippers throughout with protective cover flaps. A nylon rain cover is included and enclosed in a Velcro secured bottom compartment. The rucksack is made of 500D Cordura Nylon with DuPont Teflon fabric protection. It weighs 1,950 grams (4.3 lbs) empty and comes with a five year manufacturers warranty. The Wisport Whistler 35 II Rucksack rides super comfortable, perhaps the most comfortable of any I have ever used. The large, padded hip belt truly assists in putting more of the load on those big bones and muscles in your hips and taking some of the pressure off your shoulders and back. The shoulder straps are also well-padded, adding to the comfort level. 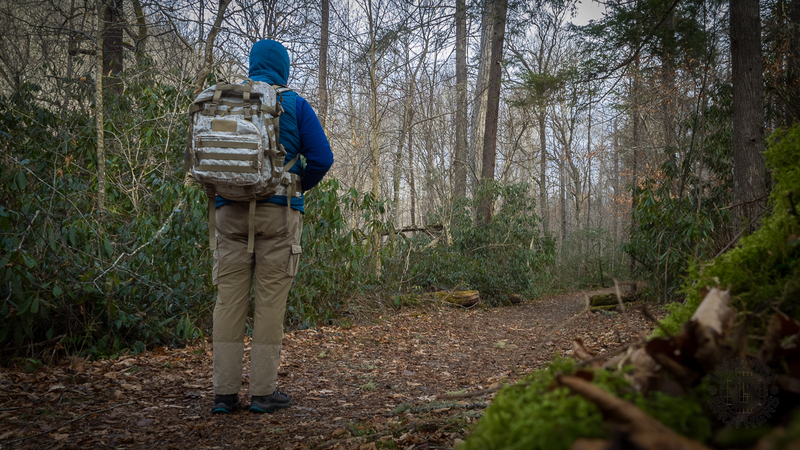 I purposely loaded the pack up with lots of gear and accessories adding plenty of heft, and it all balanced ideally through the full length of my core. It was something I noticed immediately. When putting it on and buckling it up, I thought to myself, “Wow! This is comfortable.” Despite being loaded, it didn’t seem heavy to me. My second favorite feature is the wealth of pockets. In fact, I was joking with my hiking companion that with so many pockets, I’m likely to lose something in one of them, not knowing which one I put it in. There are pockets inside of pockets. Start with the outer side pockets that are ideal for water bottles or snacks. Behind the frame is a hidden full length pocket that would be perfect for storing a jacket or blanket. The main compartment has the full-length hydration bladder sleeve, a half-length covered nylon pocket for items requiring water resistance, and a half-length mesh pocket where I stored things like first aid and wrapped food. There’s another complete set of pockets outside the main compartment. This is where all the goodies and accessories go. Inside is another half-length mesh pocket and a quarter-length mesh pocket. Add to that a half-length open pocket for your larger items. I used this for a flashlight-multitool kit and binoculars. Round it out with three narrow pockets for things like a pocket knife, firestarter, camera memory card and spare batteries, etc. Oh, I almost forgot. There is one more half-length zipped pocket on the very outside with easy access. That’s where I stowed my trail map. Really anything flat would go great in there. Add to all these pockets dozens and dozens of MOLLE attachment points both inside and outside the storage compartments. You can carry pretty much anything with a clip, d-ring or hook. Really well thought out. The hydration bladder sleeve is extremely roomy. I have a three liter bladder that has its own insulated blanket. Even with the bladder in its blanket, it fit with plenty of room to spare. I have not found that to be the case with any smaller rucksack. 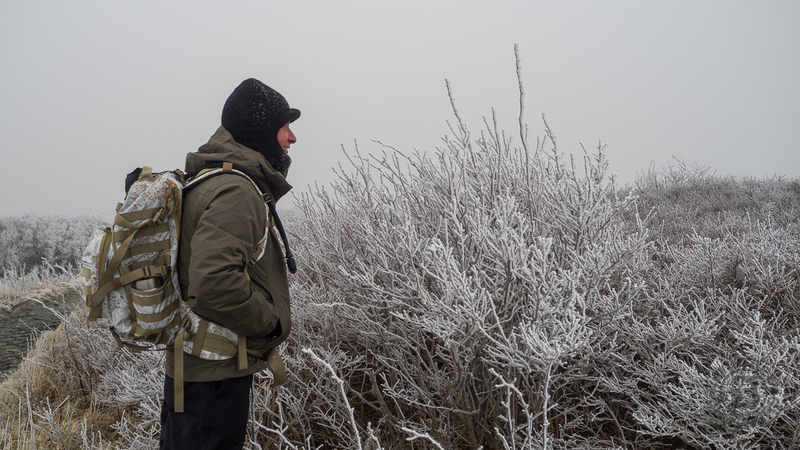 All in all, I am exceptionally impressed with the functionality and comfort of the Wisport Whistler 35 II Rucksack. It is roomy enough for multi-day backpack trips, but not so much as to be a burden. The comfort and weight balance are superb. You don’t need to leave anything at home with all the pockets and MOLLE attachment points. Even going so far as to include its own rain cover is a customer benefit. Very well done Wisport. The Wisport Whistler 35 II Rucksack comes in nine colors, most with a military or law enforcement motif. The color I chose is called Pencott Snowdrift, a winter camo. The rucksack has a suggested retail price of US$161.95. You can purchase one from Military 1st at their website. Check for availability before ordering. As I gain more experience using the Wisport rucksack I will be sure to return here to offer more thoughts to help you make your own decision about whether to purchase. For example, I will report on durability after a couple years. In the meantime, I recommend this product.